Suzanne has commented on my last entry that I have plenty of blog postings about food. I kinda noticed that too. So, to have a bit of a change, I'll blog about something else for today. I am not guaranteeing that you will not see any more posts about food, but at least, no food for today's post. Recently, I have discovered a genre of music that has simply captivated me. It is the music of Astor Piazolla. 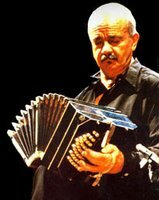 Astor is a famous Argentinian composer, mainly of tango music, and has been said to be the originator of nuovo tango, or new tango. I just downloaded a CD of his works, and I cannot get enough. Speaking of music, I realized that my music tastes are constantly evolving through the years. My first memory of actually being enthusiastic in music was my years in Japan, 1995-2000. These were the years when I was studying piano, and thus was so interested in classical music. I then started writing my own pieces for different instruments. I thus collected tons of classical sheet music during the five years I stayed in Japan. Come 2000-2001. I first started watching MTV, now I added rock to my collection. Although I still continued to study piano, I also enjoyed listening to the radio, something I didn't do before (I didn't find Japanese pop music amusing.). Then my parents complained why I like to listen to music that sounded like gongs and plates being broken (an allusion to the hard beats of rock). This is also the time when I experimented with gothic fashion. When I came back to Manila, this gothic fashion evolved into a more high-brow type, a preppy gothic fashion. 2001-2005 was the time I was in undergrad. I didn't really focus in music these years, but I downloaded some music from bands that are not in the Top 40 list, like Chevelle, Lacuna Coil, and Breaking Benjamin.This was also the time when I started becoming fascinated with avant-garde classical music, such as works by Olivier Messiaen, Bela Bartok, and other modern composers. Before I flew to Buffalo, I bought my first-ever Latin-inspired album, the latest work by Robi Rosa, Mad Love. Since then, I have been interested in Latin music, and now I am immersing myself in Piazzolla's music. Music aside, I have been very busy today. I did an assignment in my Syntax class, and it is about argumentation. 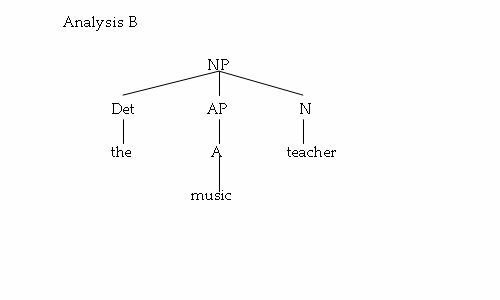 I am given the task to choose between two analyses which is the better structure for a noun phrase. Let me show you a couple of analyses. The first analysis is saying that in the noun phrase the music teacher, the phrase [music teacher] makes a constituent. The second analysis does not imply that. 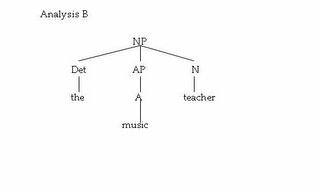 The second analysis treats all three words as equal. 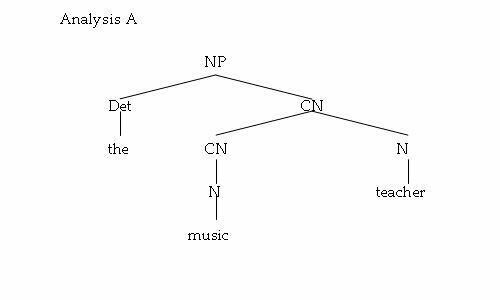 However, that is not the case when one uses constituency tests to identify the constituent structure of the noun phrase. That is why it is grammatical to say The music teachers and PE instructors are staging a protest.. One can conjoin them with an and and be grammatical. This is proof of constituency, which Analysis A predicts and Analysis B does not. Oh well, I do not want this post to be too technical, I still want this blog to be user-friendly, and not be too specialized. Well, I have to go, wakefulness is slowly depriving me of my spirit.